Prior to 1968 landlords of residential and commercial property enjoyed broad immunity from personal injury lawsuits filed by their tenants. In 1968 the California Supreme Court, in Rowland vs. Christian held that a landlord could be sued by a tenant for personal injuries suffered by a tenant due to a defective condition(s) on the rental property under general rules of negligence. 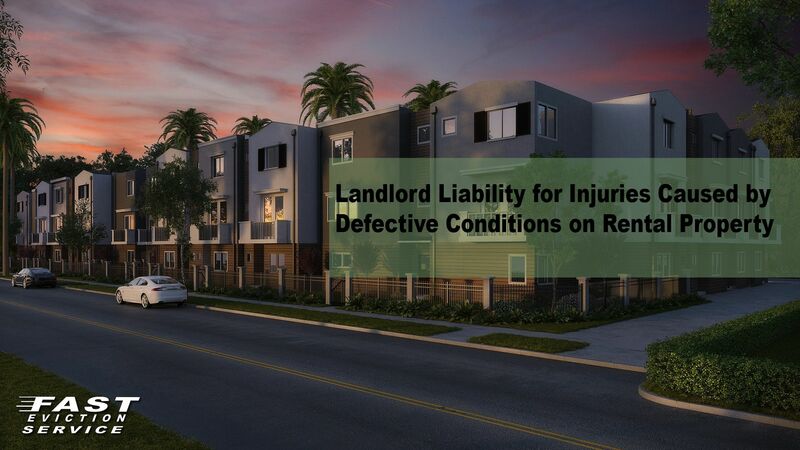 This article will be a general discussion of a landlord’s or a property manager’s civil liability for injuries caused by defective conditions on rental property and will focus solely on the general concepts of negligence. First, it is paramount that a landlord or a property management company purchase a general liability insurance policy to cover the rental property. This will provide the landowner and property management company coverage for claims made against them and will pay for damages awarded to a tenant and attorney fees incurred in the defense of the case. Care should be taken with what type of policy is purchased and the landlord or property management company’s attorney should carefully review the policy to determine what is covered and what is excluded. This concept of landlord liability for injuries on rental property is very broad. Thus, the concept of reasonable care requires landlords to ensure that the property is safe at the beginning of tenancy and to repair any hazards that the landlord learns about later as they occur. One California Appellate decision has ruled that it is possible that a landlord or property management company can be held liable for damages that are claimed to have resulted from the failure to take reasonable measures to protect against severe or pervasive sexual harassment. This broad theory of landlord liability focuses on the public policy that the financial responsibility for making sure that the property is free and clear of potential hazards that would expose a tenant or a guest should rest on the landlord or property management company who has the ability to ensure that the property is safe when the tenancy is created – and creates a duty to maintain the rental property during the course of the tenancy. This broad duty of liability applies to the interior of the rental unit, exterior of the rental unit and certain areas surrounding the rental unit that the landlord or property management company has control over. Duty: Did the landlord or property management company have a general duty to protect against the harm suffered by the tenant? Breach: Did the landlord or property management company breach that duty by failing to proactively maintain the property from such harm? Causation: Was the landlord’s or property management company’s breach of that specific duty of care a substantial factor in causing injury to the tenant? The tenant must establish a nonspeculative, substantial link or nexus between the omission and the injury. Damages: Was the injury suffered a foreseeable risk from the negligence of the landlord’s or property management company’s negligence and are they reasonable? As you can see the theory of general liability against a landlord or property management company for the failure to properly maintain the interior and exterior of the rental property throws a very large net that can catch even a very proactive landlord or tenant. This theory has expanded over the years based on the very broad public policy that the landlord or property management company is the most financially able to protect against such perils presented by poorly maintained rental property. So what should the landlord or property management company do to best protect themselves from such liability? First, no proactive policy will protect against all lawsuits. There are very hungry personal injury lawyers who are looking for premises liability type cases and advertise on the radio and television for such case. Second, to mitigate against such claims the key is to maintain the property using the latest and greatest technology possible. Create a proactive preventative maintenance policy and procedure that ensures that each rental unit is inspected by the use of a 24 Hour Notice of Intent to Inspect the Rental Unit at least twice a year. Document the posting of this notice – and the tenant’s denial of access if that should occur. Document all requests and work orders for repairs and the response to these orders. Using a cell phone take photographs and/or a video of the condition of the rental property upon entry, beginning and ending the work order/repair process. Third, if the landlord or property management company is notified of a claim immediately notify the Insurance Company to allow them to start to investigate the claim and take the appropriate witness statements. This article does not provide specific legal advise and is not intended on covering all aspects of premise liability. The intent of this article is to discuss in very broad terms what a landlord or property management company’s duty is to maintain the rental property to avoid potential personal injury claims. Specific case situations will require specific legal advice. The reader is encouraged to discuss any specific legal questions regarding liability for injuries caused by defective conditions on rental property with a qualified attorney of his or her choice.